Once again I look into my toolbox to see what is in there that might be useful in creating a work of art. 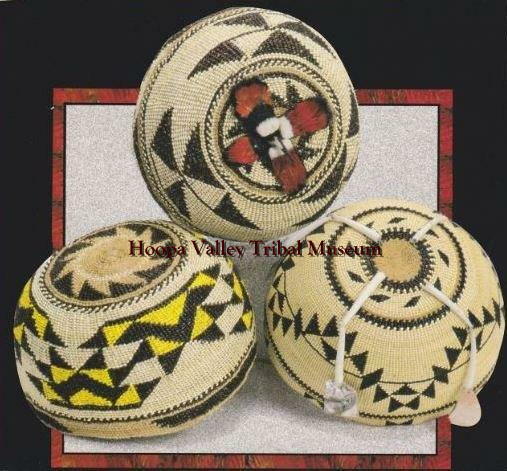 There is information from the people of the River Tribes for whom I served for eleven years regarding the methods they use to color the materials they gather for making their traditional baskets. 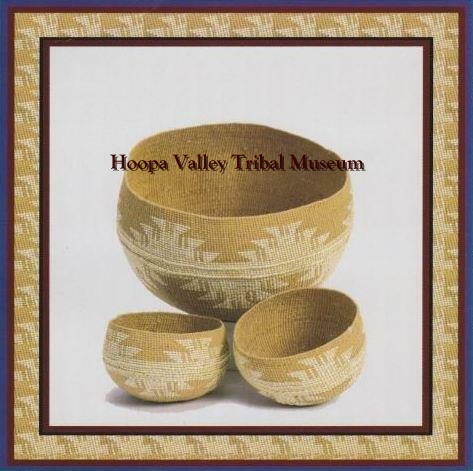 The people of the Hupa, Tolowa, Wiyot, Yurok and Karuk nations all use similar techniques, materials and design. 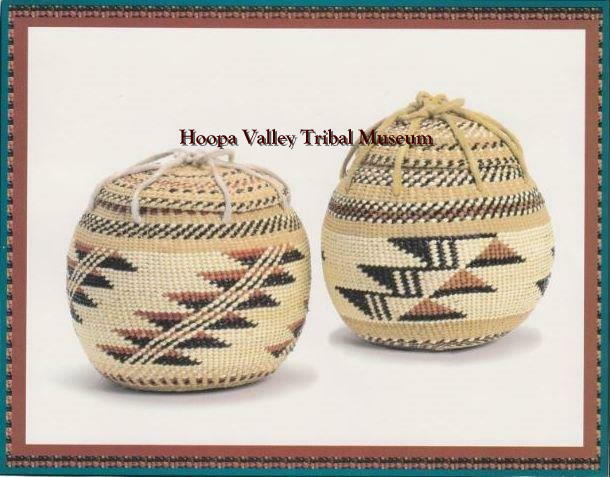 The baskets are woven using a method often found in texts under the heading of twining; these finely twined baskets serve a wide variety of purposes historically and still today. They are woven for ceremonial regalia like the “basket hats” pictured below. Additionally they were woven for gathering and for cooking acorns; a stone was heated in the fire and put into the basket to cook the acorns. Tribes whose language was not historically written down often used symbols for particular animals and events in their lives. In order to put symbols in their basket weaving they needed to have more colors than the natural tans, browns, off-white and grey that result from drying the wild crafted materials such as willow shoots gathered at the edges of creeks and rivers, myrtle and hazel shoots, roots from evergreen trees like the pine and spruce which are plentiful in this northwestern corner of California, beargrass and ferns. Most often they used the black fern and woodwordia fern. And here, the magician has for many thousands of years used mainly two preferred dyes in the making Karuk basket designs. They are alder bark and Wolf moss. Alder bark is for the red color. It is gathered by removing small patches from the tree. The bark is broken up into small chunks or pieces than pounded and put in a container with the prepared woodwardia fern. It is covered with water and sits until the color takes. To set the color, they dry the fern in the sun. Wolf moss (tree lichen) is collected from Pine and Fir trees in the high country. The Wolf moss produces a bright yellow color. Porcupine quills are dyed using Wolf moss. Oregon Grape root and Durango root are used for yellow dye but it is not the preferred material for the yellow in a basket design. Another magician’s tale of color came to my attention when a friend attended a workshop at the state wool growers meeting; color was obtained using mushrooms. The instructor of the class, Miriam C. Rice, was the author of the first text on the use of mushrooms to color fabric and paper, “Let’s Try Mushrooms for Color”. This text is still available used at steep prices; Her second publication, “Mushrooms for Color” in 1980 is also still available at prices a bit lower. Both texts were illustrated by Dorothy M. Beebee. In 1984 she collaborated with the Swedish authors, Carla and Erik Sundstrom and published a text in Swedish, “Skapa av Svampfärgat Garn. The colors obtained from the mushrooms covered nearly the entire spectrum and their beauty had me searching for anything and everything I could find out about how to have success with using mushrooms. There was a class in Mendocino that I was able to attend to witness the magic of color creating with mushrooms. Miriam also developed “Myco-Stix” which are used like a crayon for mark making. Her methods are presented in the third and final book she wrote, “Mushrooms for Dyes, Paper, Pigments & Myco-Stix” was published by Mushrooms for Color Press in Forestville, Ca, 95436. The ISBN is 9781604-618020. The IMDI was created by Miriam C. Rice in 1985 to encourage the use of Fungal Pigments; to further research on their extraction and employment; to encourage research and cultivation of dye fungi; to financially assist artists and researchers to participate in the international symposia and exhibitions” – this information is from the web site: http://www.mushroomsforcolor.com/ Miriam passed away in 2010 after leaving a legacy of well documented experiments on the use of mushrooms to obtain pigment for coloring fiber, paper, yarn and threads. If exploring the use of mushrooms for dyeing becomes a tool you want to use after doing a bit of reading on the subject, the Mycological Association of Sonoma County, in California, will be having a camp for learnersthe summer of 2015. The last bit of exploring of magical color being added to the cloth and thread used in making beautiful fiber creations comes under the name “Eco-Dyeing”. This involves principally using the pigment in flowers, stems and leaves of plants to color the fibers. Some color transfers use the technique of rubbing to transfer the colors and others employ putting the botanical source on fiber, rolling it up and wrapping it with twine before immersion in a “bath”. And there is the use of plant material dried and crumbled, or cut up in small pieces and added to a pot that is heated with the fiber in the pot to absorb the color. Indigo is one of those plant materials with which many folks are familiar; this is but a tiny piece of the available colors one can obtain using plants. There are some well-known textile workers using these techniques to create the substrate for their work and here is a bit of information on some of those with whom I have had some interaction over the years. Kimberly Baxter Packwood is a professional mixed-media artist who specializes in surface design using natural dyes, rust, and wax. http://www.kbaxterpackwood.com/ Kimberly has detailed information on using plant materials for dyeing as well as other extracted natural sources of dyestuff and rust. This statement is from her website “Kimberly uses natural materials and processes to demonstrate the progression of the native prairie from its ancient origins to the present through color, texture and form. Through the use of Natural Dyes, Ocher’s, Earth Pigments, and rust on cloth she is able to explore the tension between the natural and the unnatural (man-made)”.Kimberly has detailed charts on natural dyestuff, what materials they will dye and what colors you would expect to achieve. She is a wealth of information for anyone desiring to use natural dyes to create color and pattern on cloth, threads or paper. Kimberly can be found on Facebook. Arlee also write a wonderful and entertaining blog, http://www.arleebarr.com/designjournal/. She writes the following description of herself: “I’m curious, eccentric and just a little opinionated. Surrealist in thought, Fauvist at heart, this is my almost daily art journal, eccentric and eclectic, explorative and absurd.” Her adventures with using cloth that has been eco dyed for her heavily hand embellished stitches to create pieces of amazing texture and delightful color explorations are also to be found on her Facebook page. 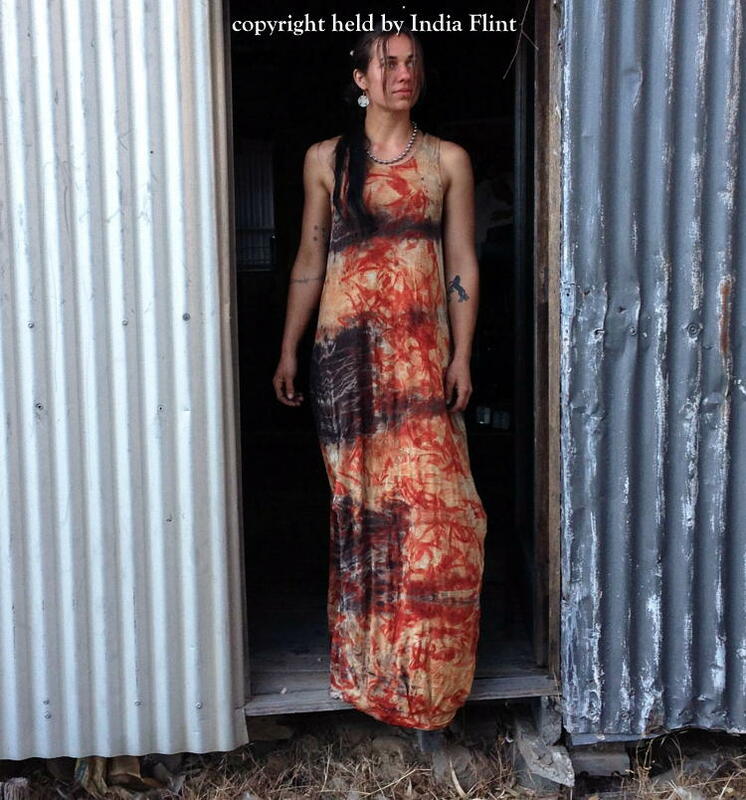 One woman who is traveling the globe creating and teaching the techniques of eco-dyeing is India Flint from Australia. 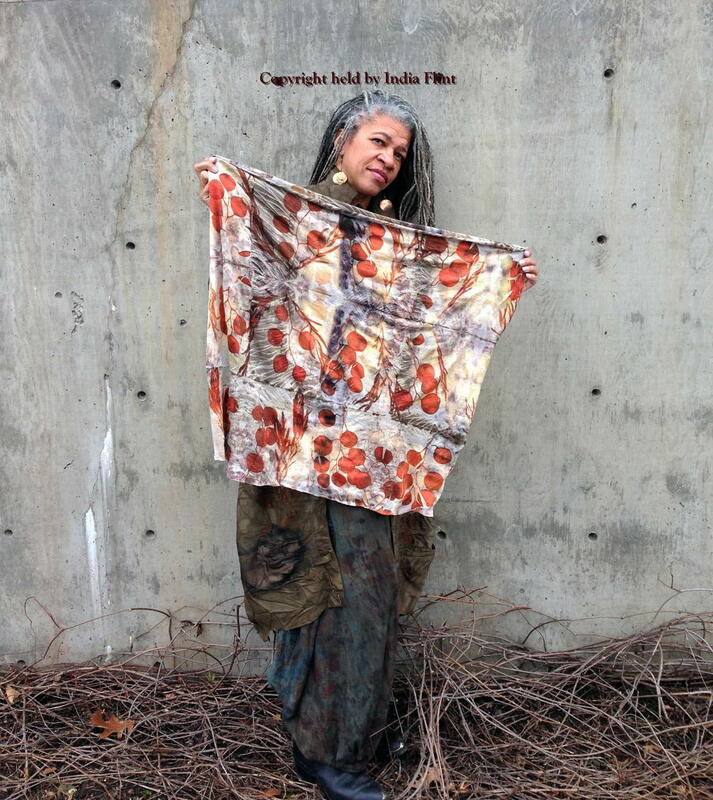 Her website: http://www.indiaflint.com/ describes her “maker of marks, forest wanderer & tumbleweed, stargazer & stitcher, botanical alchemist & string twiner, working traveller, dreamer, writer, and the original discoverer of the eucalyptus ecoprint, …dyeing for a living in the deep south”. She has published a new book that is available at http://au.blurb.com/b/4962838-stuff-steep-+-store. 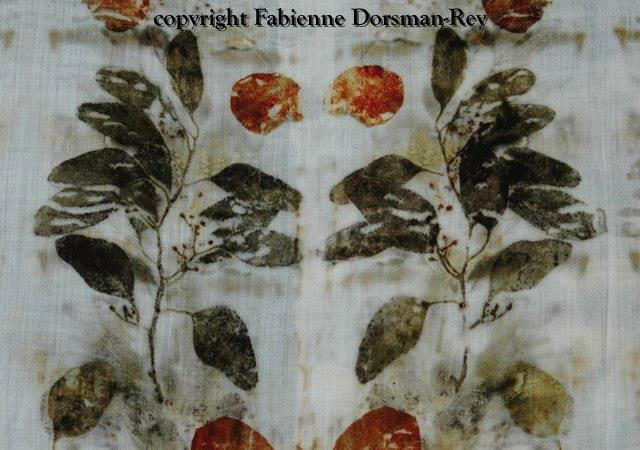 Her previous books “Eco Colour: Botanical Dyes for Beautiful Textiles”,and “Second Skin” are available on-line both new and used. She currently write a blog http://prophet-of-bloom.blogspot.com.au/ that has information on her travels, teaching schedule and artwork for sale. Here are two photos of her ecoprinted fabric in clothing. India is also on Facebook and many more of her photos can be seen there. 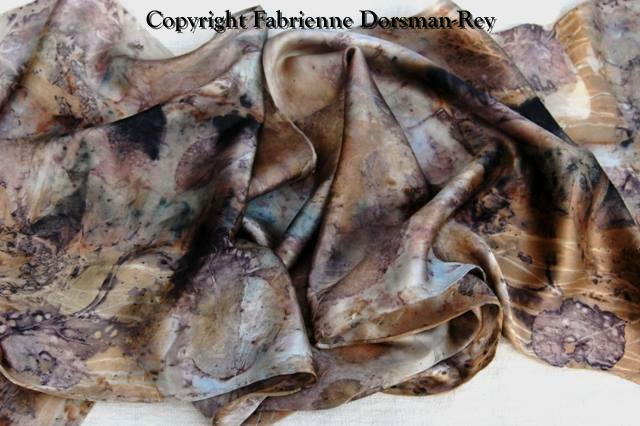 Fabienne Dorsman-Rey is the last of the fiber artists using ecodyeing who I will share with you in this piece of writing. She lives in the Netherlands in the region of Utrecht. She does not have a web page nor blog and her Facebook page is not public, you will need to become a friend to see her amazing collection of photos of her work. She is included in an exhibit that will be at the Jacoby Art Center in Alton, Illinois. 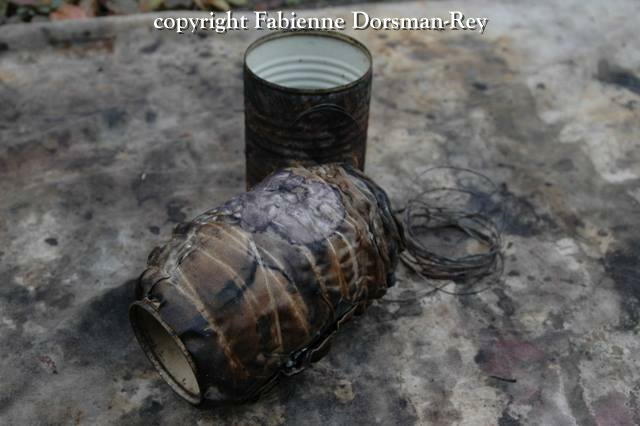 This is An International Exhibiton Opening August 22, 2014. jacobyartscenter.org . From the webpage are these words from Fabienne “I must confess: it’s an incurable virus. And I love to spread it. There is nothing more exhilarating to me than opening a bundle and letting myself be surprised by the result. It’s a gift to my heart or shall I say, to my inner child. It feeds me. It gives me joy. I’m first a colorist. 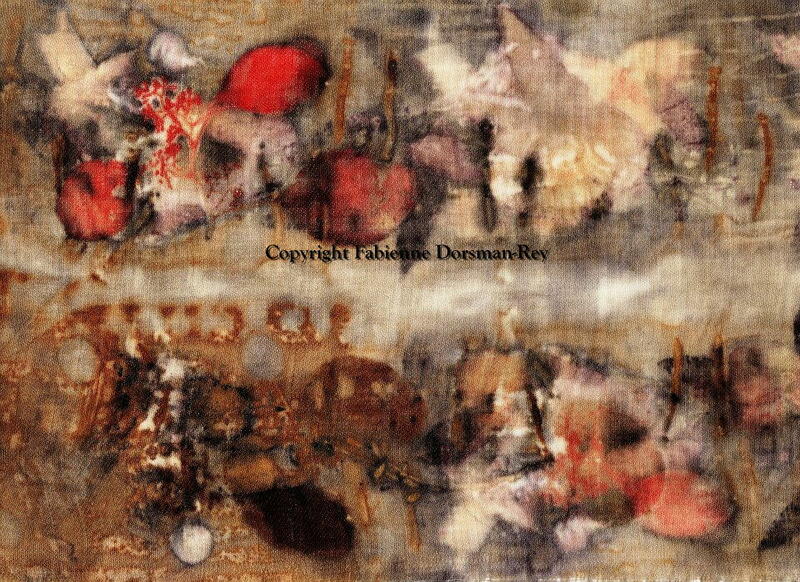 I’ve tried many years to paint abstract textures like this, but I could not. In this dialogue with Nature, I get sometimes results beyond anything I could have dreamt of painting. By letting go of the illusion of control, more is realized. There is wisdom in that, to be applied to other areas of my life.” She has provided me with the following photos; the first two show a cloth wrapped around a tin and then the beautiful silk scarf that emerges, the other two are of cloth she has printed with the plant materials she has gathered. With the explorations in this paper your tool box should be bursting with ideas and encouragement to at least play a bit with the magic of obtaining colors from growing things…from trees, bushes, flowers, grasses and mushrooms. The successful work being accomplished around the globe continues processes employed by people for generations; sometimes new occurrences in the dye process present the possibility that the results are something never before seen by man. May you explore these techniques and see if you might find a color, process or technique that is totally unknown. Thank you Kristin for the delightful surprise of finding myself mentioned here 🙂 Natural dyes, and the related cloth marking processes of rust, compost and contact printing makes collaboration with Mother Nature a constant adventure. Though some results are predictable, the inherent natural “graffiti” that occurs can really stretch your design and technique ideas, and skills (!) to translate the image. Such a wonderfully informative article. I thoroughly enjoyed the article and the beautiful photos. Thank you for the links…I will save them to refer back to in the future. Such amazing references. Thank you for all your hard work, time, and your heart that you put into writing this article. True, their focus is not exclusively on dyeing, but they have a collective philosophy allied with a determination to use traditional as well as innovative technologies in the designing and making of their cloths. The results of their collaborations are amazing – truly awe inspiring. This is a wealth of materials and information on a subject which I knew almost nothing about. As a resource, it’s invaluable. I think this ties in with something Terry Grant and I were talking about not long ago: there a huge gap, perhaps necessary, between art work and ideas which are the result of hundreds of years of cooperative and accumulative effort, work such as indigo dying and manipulating of the results, and the work that comes from individualistic (mostly western cultures since the 19th century) where the emphasis is on the individual artist. I find that gap much more interesting than the ongoing discussions of “art” and “craft” but I don’t see much discussion of them. The photos of baskets you provided are a case in point. I have no way of twisting my mind around these widely different approaches — as westerners we aren’t much into communal art today, and certainly we don’t reward them much. And we are even less into communal effort — if the art is accomplished through a group effort, credit is given only to a single person. Your research has identified both communal and individual efforts and pointed out, if only by inference, this strange gap in our thinking. Thank you. And thank you as well for doing the enormous amount of work that your article here provides. I suspect that fiber artists will be referring to it for years. I was wondering about providing the fiber art networks — SAQA, Quilt Art, and even Facebook — with a link to Ragged Cloth when these new articles appear. Once again, I think Ragged Cloth is doing the best work of its sort in the field. I so appreciate your taking time to read and see deeply into the article I researched and wrote. Thank you for your keen vision that sees, as I do, that the conversation about art vs craft uses much energy; energy that will be well spent reading, experimenting, learning and doing whatever it is we want to do with our art. I will post a link today – need to learn the technical how to for that, but will figure it out, thanks for the suggestion. Olga, although the information and curiosity to learn ever more and more about the extraction of color is always sitting as notes in my journal in the toolbox, I, too, do not spend time doing the exploring. It is my pleasure to gather materials for folks who do dye and I do a small bit now and then just to be a part of that transformational experience of surprise and delight as the colors come alive on cloth or paper. Finding people who practice the process and gifting my muse a piece or two of their cloth to incorporate in my studio work is a most delicious gift to myself. Getting some resource information for the readers had me spending hours as I followed one address to another and on and on, learning, seeing and appreciating how much wonderful work folks are doing with the freely gathered, saved and used materials all around us. Kristin, your post has got me thinking about a technique which normally does not cross my mind. I found myself being fascinated by your information and links about the pursuit of colour by the native tribes, and from there the pursuit of applied colour by early peoples. I don’t know if it would be described as science or technology, but the original experiments in obtaining colour from the environment must have been exciting and frustrating in equal measure. Perhaps that is still true today? I find that it is equally interesting to think about why we now want to step back. Humans pursuing knowledge and techniques to dye from the use of naturally available sources through to chemically developed ingredients seem to some minds to have gone too far. I wonder where the cut-off line is, and who chooses which technologies have gone beyond that point? Although I have never been attracted to dyeing in forms other than using ink in printing, I understand the anticipation and the joy of random results. Indeed that is one of the aspects of printing which I enjoy. But despite not normally being interested in dyeing for my own work, your article has piqued my curiosity to read more about the subject: to dip my mind, if not my hands into the dye pot.